Active Directory is essentially a database of network resources (known as objects) and information about each of these objects. While NT 4.0 was a pretty good networking operating system back in the day, it wasn't entirely equipped for enterprise networking. The network neighborhood was a great tool until you had a huge network, then browsing problems would begin and finding a particular printer or server could become a nightmare especially if you didn't know the name of it. Furthermore, in order to even accomodate such a network, you would most likely have to partition it into several domains connected with trust relationships. AD solved many of these problems and offered a new level of scalability and orginization for enterprise computing. The directory of each domain can store as many as 10 million objects which is enough to accommodate millions of users per domain. First let's introduce the concept of "Sites". Sites are used to define the boundaries of high-speed links on a network containing Active Directory Servers. Sites are based on IP subnets and are defined as a "well-connected subnet or subnets". Do not confuse this term with the concept of domains which are discussed next. One thing that didn't changed from the NT 4.0 days is the use of domains. A domain is still the centerpiece of a Windows network, however, it is set up differently. Domain controllers are no longer separated into PDCs and BDCs. Now there are simply DCs (Domain Controllers). By default, servers are installed as Standalone Member Servers. DCPROMO.EXE is the Active Directory Installation Wizard and is used to promote a non-domain controller to a DC and vice versa. The wizard prompts for all of the required information to install Active Directory under the conditions that you have asked it to run Knowledge Consistency Checker (KCC) - This is a service created in order to ensure that the Active Directory service can replicate properly. It runs on all DCs and automatically establishes connections between individual computers in the same site. These are known as Active Directory connection objects. 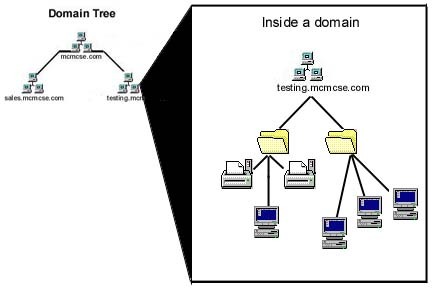 An administrator can establish additional connection objects or remove connection objects, but at any point where replication within a site becomes impossible or has a single point of failure, the KCC steps in and establishes as many new connection objects as necessary to resume Active Directory replication. Each domain controller in a domain is capable of accepting requests for changes to the domain database and replicating that information with the other DCs in the domain. 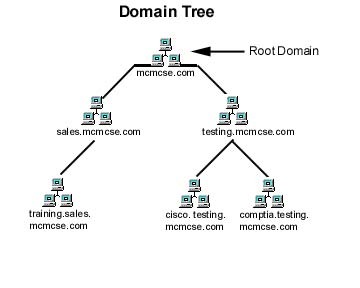 The first domain that is created is referred to as the "root domain" and is at the top of the directory tree. All subsequent domains will live beneath the root domain and are referred to as child domains. The child domain names must be unique. 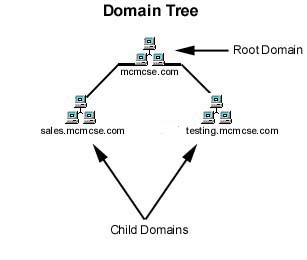 When a root domain and at least 1 child domain have been created, a "tree" is formed. Remember and understand this term as you will hear it often when working with a directory service. You can see that the structure begins to take the shape of a tree with branches and sub-branches. Now what if we are a company like Microsoft or DuPont that owns several other corporations. Typically, each company would have its own tree and these would be aggregated together via trusts to create a "forest". Let's look at an example using our site. So let's say that our company owns techtutorials.net (actually that is true) and xyzabc. You can see that the individual trees are organized just like the root domain (mcmcse). Trusts are much more easily managed in Active Directory than they were in NT 4.0. There are 2 main reasons that this is the case. When a new domain is added, trust relationships are automatically configured. Trusts are now commutative 2-way trusts. This means that if domain A trusts domain B then the reverse is automatically true. In Windows NT 4.0 trusts had to be administered as a series of 1 way trusts and could be quite cumbersome. Trusts are automatically transitive which means that if domain A trusts domain B and domain B trusts domain C, then domain A trusts domain C and vice versa. These changes save an adminstrator some of the time consuming administration efforts spent creating and maintaining trusts. 1-way trusts can still be created when necessary. Now that we have looked at the big picture, it is time to take a look at what happens inside a domain. To get started, the first concept that you will need to understand what the directory is made of. A common analogy for a directory is a phonebook. Both contain listings of various objects and information and properties about them. Within the directory are several other terms that you must know to gain even an entry level understanding as to how it all works. Objects - Objects in the database can include printers, users, servers, clients, shares, services, etc. and are the most basic component of the directory. Attributes - An attribute describes an object. For example, passwords and names are attributes of user objects. Different objects will have a different set of attributes that define them, however, different objects may also share attributes. For example, a printer and Windows Vista computer may both have an IP address as an attribute. Schema - A schema defines the list of attributes that describe a given type of object. For example, let's say that all printer objects are defined by name, PDL type and speed attributes. This list of attributes comprises the schema for the object class "printers". The schema is customizable, meaning that the attributes that define an object class can be modified. Containers - A container is very similar to the folder concept in Windows. A folder contains files and other folders. In Active Directory, a container holds objects and other containers. Containers have attributes just like objects even though they do not represent a real entity like an object. The 3 types of containers are Domains, Sites and Organizational Units and are explained in more detail below. Domains - We have already discussed this concept in the preceding paragraphs. Sites - A site is a location. Specifically, sites are used to distinguish between local and remote locations. For example, company XYZ has its headquarters in San Fransisco, a branch office in Denver and an office that uses DUN to connect to the main network from Portland. These are 3 different sites. Organizational Units - Organizational units are containers into which you can place users, groups, computers, and other organizational units. An organizational unit cannot contain objects from other domains. The fact that organizational units can contain other OUs, a hierarchy of containers can be created to model your organization's structure and hierarchy within a domain. Organizational units should be used to help minimize the number of domains required for a network. Now that we know what these concepts mean, let's take a visual look at what is going on inside a domain. The folder symbols represent Organizational Unit(OU) containers and within each of these we find objects such as printers, servers, computers, users, etc. Instead of objects directly located inside these OUs, there could be more OU containers. Active Directory uses the Lightweight Directory Access Protocol (LDAP) to supply the naming convention for objects. The 2 basic concepts that you need to know are distiguished names and common names. Distinguished names are the complete "path" through the hierarchical tree structure to a specific object. This is similar to specifying the complete path to a file from a DOS prompt. This "path" points to the location of an object in the hierarchy. Let's take a look in more detail. OU - Organizational Unit. This attribute is used to divide a namespace based on organizational structure as previously discussed. An OU usually is associated with an Active Directory container or folder. DC - Domain Component. Domain components . A distinguished name that uses DC attributes will have one DC for every domain level below root. Another way of thinking of this would be that there would be a DC attribute for every item separated by a dot in the domain name. CN - Common Name. This attribute represents the object itself within the directory service. AD also supports several other naming conventions in addition to distinguished names as listed in the table below. So now that we have seen how complicated the naming conventions can be, let's look at the tool that makes it all manageable. Active Directory uses a service called the Global Catalog (GC) that is used to locate any objects on a network to which a particular user has been granted access. The searches that can be performed are advanced and not only is capable of locating objects by name, but by attributes as well. So if I have a 50 page document and I need 1000 copies made, I probably won't want to send it to an HP 5si. I need to find a production printer that can print at least 100ppm and has the capability of binding the document. The Global Catalog allows me to search the network for a printer that has these attributes. I find a Xerox Docutech 6135. I can add the driver and send the print job. But what if I am in Portland and the printer is in Seattle? The GC will provide this information and I can email the owner of the printer and ask them to ship the job to me via our internal mail system. Still a little confused? Let's take a look at another example. Let's say that I get a voice mail from someone named Betty Doe in the payroll department. Her voicemail is garbled and I can't understand her phone number. I can use GS to search for her by name and then access her phone number (assuming that our network administrator has stored the phone number attribute for users in the schema). What other previously existing application has features similar to this? The answer is Microsoft Exchange. Exchange also has a global catalog that allows you to find users by name. GC is a scaled up version of this feature in exchange in that it allows you to find objects based on a variety of customizable attributes. When a new object is created in AD, it is assigned a unique number called a GUID (globally unique identifier). The GUID is useful because it stays the same for any given object even if the object is moved. The GUID is a 128-bit identifier, which means that applications that reference objects in Active Directory can record the GUIDs for objects and use the GC to find them even if it has been moved. Windows networks heavily on AD, and thus, it is very important that the service is running, fast and accessible at all times. In order to accomplish this, the AD database must exist on multiple servers so that if one server fails, a client can contact a server with duplicate services and information. This not only creates redundancy, but reduces the load on individual servers. All that needs to be done for a domain controller to become a replication partner is to add it to the AD domain. One of the most complex parts of making redundant servers work properly is replicating the information and ensuring that all servers have the most up-to-date content. Active Directory uses multimaster replication, which is another way of stating that updates can occur on any Active Directory server. This also means that there is not a master domain controller and all DCs work together in a peer relationship. Each server keeps track of which updates it has received from which servers, and can intelligently request only necessary updates in case of a failure. This is accomplished via the use of unique sequence numbers (USN). Every time an update is made, it is assigned a unique sequence number from a counter that is incremented whenever a change is made. Remember from earlier that the schema is a list of attributes that define a given object type. The schema master FSMO role is the DC responsible for performing updates to the directory schema. This DC is the only one that can process updates to the directory schema. Once the schema update is complete, it is replicated from the schema master to all other DCs in the directory. There is only one schema master per directory. 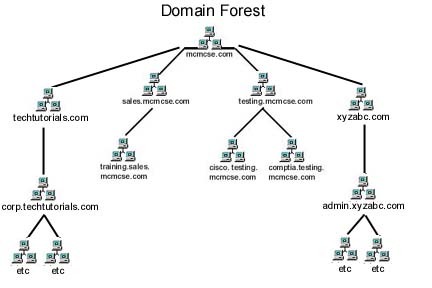 Domain Naming Master Controls the addition of Domains in a forest. This DC is the only one that can add or remove a domain from the directory. RID Master(Relative Identifier Master) works with domain controllers to assign unique SIDS to each object that requires one. Each object gets a domain SID that is common to all objects in a domain. What makes SIDS unique is the RID which is unique to all objects in the domain. The RID Master is also responsible for removing an object from its domain and putting it in another domain when an object is moved. PDC Emulator acts like a PDC from a Windows NT 4.0 network and is necessary in domains that are not native (i.e have Windows 95/98/NT down-level clients). It does a lot more than that. PDC Emulator is the root time server for synchronizing the clocks of all Windows computers in your forest which prevents authentication problems. Another function of the PDC Emulator is that it is the domain controller to which all changes to Group Policy are initially made and from there the GPO is replicated to all other domain controllers in the domain. All password changes and account lockout issues are handled by the PDC Emulator to ensure that password changes are replicated properly and account lockout policy is effective. Updates user to group memberships when changes are made. Default groups, such as the Domain Admins group, are security groups that are created automatically when you create an Active Directory domain. You can use these predefined groups to help control access to shared resources and to delegate specific, domain-wide, administrative roles. Many default groups are automatically assigned a set of user rights that authorize members of the group to perform specific actions in a domain, such as logging on to a local system or backing up files and folders. For example, a member of the Backup Operators group has the right to perform backup operations for all domain controllers in the domain. Default groups are located in the Builtin container and the Users container. The default groups in the Builtin container have a group scope of Builtin Local. Their group scope and group type cannot be changed. The Users container contains groups that are defined with global scope and groups that are defined with domain local scope. You can move groups that are located in these containers to other groups or OUs within the domain, but you cannot move them to other domains. Global: Members of global groups can include accounts from the same domain as the parent global group and global groups from the same domain as the parent global group. Members of these groups can be assigned permissions in any domain in the forest. Use groups with global scope to manage directory objects that require daily maintenance, such as user and computer accounts. Because groups with global scope are not replicated outside their own domain, you can change accounts in a group having global scope frequently without generating replication traffic to the global catalog. Members of these groups can be assigned permissions in any domain in the domain tree or forest. Use groups with universal scope to consolidate groups that span domains. To do this, add the accounts to groups with global scope and nest these groups within groups that have universal scope. When you use this strategy, any membership changes in the groups that have global scope do not affect the groups with universal scope. Group Policy is on of the most powerful administrative features and is designed to enable administrators to control the environment with minimal effort. Group Policy is administered through the Group Policy Microsoft Management Console (MMC) snap-in. Group policies are not applied to "groups", but we can apply them to OUs. An administrator can create several Group Policy Objects (GPO) in a given Group Policy Container (GPC) and assign the appropriate GPO to the computers or users that need the settings contained in that GPO. If you want to exclude certain users or computers from processing the GPO assigned to the Site/Domain/OU that they belong to, you can simply remove the users' or groups' "apply group policy" permissions. This effectively creates a filter. You can also delegate control over GPOs so that a manager can change what a GPO does for his or her department, but can't create any new GPOs or change the scope of a GPO. It is also possible to disable group policy objects without deleting them. If you do this (from Group Policy - Options) it will only disable it for that container and any sub-containers that inherit the settings. If another administrator "linked" to that GPO from another container, then the GPO is still active in that container. Software can be efficiently deployed, updated and removed using Group Policies and two technologies - Windows Installer and Software Installation and Maintenance. Windows Installer will replace Setup.exe for many applications. Its advantages include the ability to build custom installations, enable programs to "repair" themselves if a critical file is missing or corrupt and to remove themselves very cleanly when necessary. Software Installation and Maintenance combines Group Policies and Active Directory technologies to enable an administrator to install, manage and remove software across the network. When you deploy software, you can choose to assign it or publish it. Assigned software can be targeted at users or computers. If you assign an application to a USER, the icons show up on the desktop and/or start menu, but the program is only installed when the user runs it for the first time. If it is assigned to a COMPUTER, it's installed the next time the system is restarted. If you publish an application, the user can install it through Add/Remove Programs or through opening a file that requires that particular program(a file association). Published programs cannot self repair, cannot be published to computers and are not advertised on the users' desktop or start menu - only through add/remove programs. Assigned applications require a windows installer file(.msi) while published applications can use Windows Installer files or ZAP files. A .ZAP file is an administrator created text file that specifies the parameters of the program to be installed and the file extensions associated with it. Installations that utilize .ZAP files cannot self repair or install with higher privileges and will typically require user intervention to completely install. You can deploy upgrades using GPO's simply by specifying which program is to be upgraded and whether or not it is a mandatory upgrade. You can apply service packs or patches by "re-deploying" an existing Group Policy with the new information regarding the service pack. SIDwalker Security Administration Tools. Consists of 3 programs, showaccs.exe, sidwalk.exe and Security Migration Editor (MMC snap-in). First two used to examine and change ACL entries. Security Migration Editor edits mappings between old and new security IDs (SIDs). repadmin.exe Replication Diagnostics Tool. Check replication consistency between partners, status, force replication events and knowledge consistency checker recalculation. acldiag.exe ACL Diagnostics. Used to determine whether users have been granted/denied access to AD objects. Can be used to reset Access Control Lists to their default values. ADSI edit Low-level editor for Active Directory which enables adding, moving, and deleting objects within Active Directory. dfsutil.exe Distributed File System Utility. Manages all aspects of the distributed file system. dnscmd.exe DNS Server Troubleshooting Tool. Check dynamic registration of DNS resource records including secure DNS update and unregister resource records. dsacls.exe View or modify ACLs of objects in AD. nltest.exe Create a list of PDCs, force a shutdown, provide info about trusts and replication. dsastat.exe Active Directory Diagnostic Tool. Compare naming contexts on Domain Controllers and detect differences. ldp.exe Allows LDAP operations be be performed against Active Directory. movetree.exe AD Object Manager. Move AD objects like OUs and users between domains in a single forest. netdom.exe Enables administrators to manage Active Directory domains and trust relationships from the command prompt. replmon.exe Active Directory Replication Monitor. Graphically displays replication topology, monitor status, force replication and knowledge consistency checker recalculation. sdcheck.exe Security Descriptor Check Utility. Verify ACL propagation and replication for specified objects in a directory.